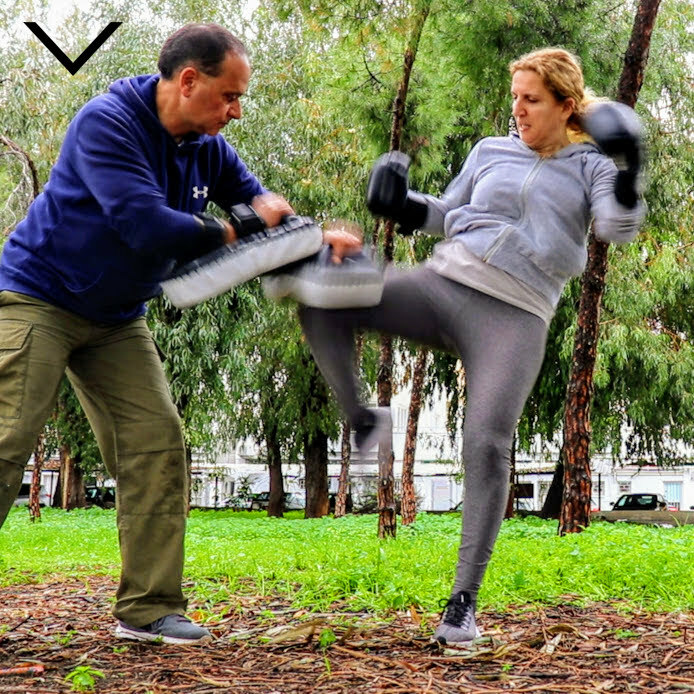 Women's Cardio Kickboxing and outdoor fitness training in Limassol. Women's cardio kickboxing, one-to-one personal training, share with a friend or create your own group class. High intensity training, 45 minute session. Burns calories fast *typically 500 - 700 calories per session (great for weight loss). Fitness cardio kickboxing is a non contact sport, no one hits you back. Feel more confident that you have kickboxing skills to better defend yourself in a self-defence situation. Builds power, strength and cardio conditioning. Best fun ever workout, release work/life stress hitting and kicking focus pads and our supersize punchbags. No two workouts ever the same (say good bye to boring indoor gym routines). Training is outdoors in the fresh air with nature (private outdoor fitness studio in Potamos Germasogeia). No boring gym machine, no treadmill, no injury causing weights to lift. Just real cardio and fitness training. In our members questionnaire, by far the #1 reason people are joining V1 FITNESS is they are bored with indoor gyms and tired of getting poor cardio results. A beginner learning striking. 3 minute workout.